Access incredible sunset views while enjoying a 7-course dinner and an open bar. 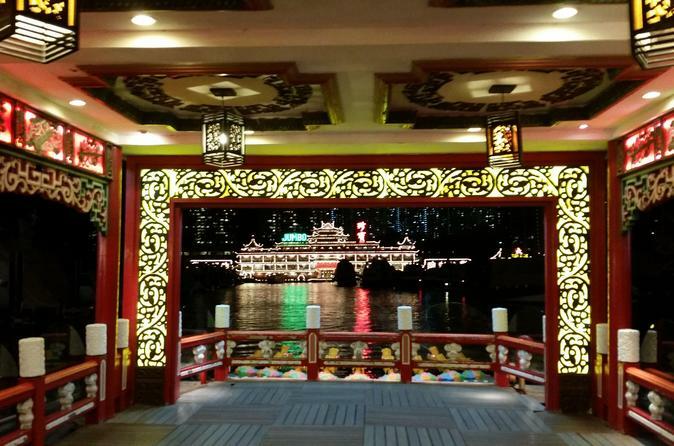 Your relaxing evening kicks off with departure from Hong Kong Island’s Central Pier or Kowloon Public Pier. You’ll embark on a scenic journey across the Victoria Harbour on a 1.5-hour Chinese boat sightseeing tour. Enjoy unlimited complimentary drinks from the boat’s open bar as you cruise past city highlights like the Causeway Bay, Lei Yue Mun Village, North Point and the glittering skyline of Hong Kong. You’ll travel by luxury motor coach to the famed Aberdeen Harbour when your Chinese sightseeing boat tour ends, where you’ll enjoy a full Chinese banquet dinner of seven courses at the famous Jumbo Floating Restaurant. 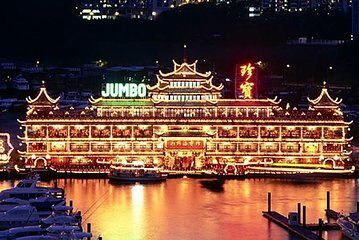 This floating palace-like destination is one of Hong Kong’s most famous restaurants and its savory dishes are not to be missed! Your coach will make a short stop at the Mid-Level lookout of Victoria Peak on your return trip to Hong Kong, where you’ll enjoy stunning city views of the skyline at night. Your four-hour tour ends with drop-off back at your starting point.